I received through bluedart. They might not have dispatched yet. Don't complaint just wait. But they said no tracking available instead they should say not yet shipped that will keep customers at ease. Did u ordered the same @Gr8ayu. I have received my backcover , which I had ordered. Product was awesome, delivery was also nice. No tracking available might be default as no update has been made. You'll receive mail as soon as they'll send the package. Ok thanks @Gr8ayu for the info. When I ordered the back cover and the micro USB to type c convertor, both the orders arrived by blue dart. I wasn't able to track my order with the tracking ID. I just had the hope that it'll be delivered to me and likewise the packages reached me in 1 week time of placing my orders. So keep calm and Believe in Smartron. This is y i was asking for the tracking id. 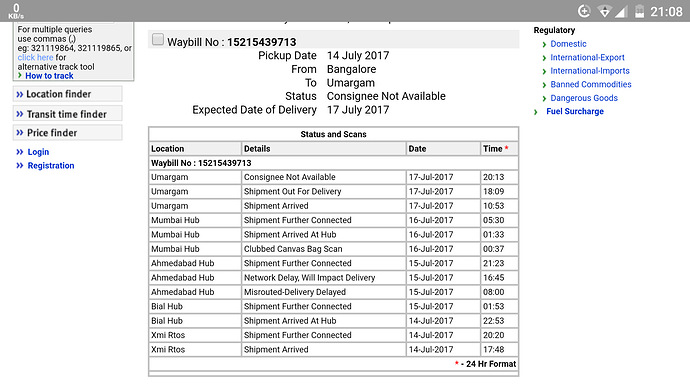 See urself on bluedart site they said shipment out for delivery at 6 pm and at 8 pm they said consignee not available. They didn't even call me. Thanks for the reply @ATMSRIRAM. But @smartron called me verified the address and an hour later bluedart guy called but I gave him an alternate address. So no worries. But this keeps happening, not only bluedart but all courier services in my town. So I am used to it, i guess. I HV ordered from Amazon, he to get back covers? It was a limited time offer. The free back cover offer is not active now. Please tell em the way i can get those. if need to purchase i'll. I was purchased it via PayTm. So, what can i do ?Will i get cover ? @raghuraj.muni @kunaljangid79 The offer has expired long back! It was a limited time offer.